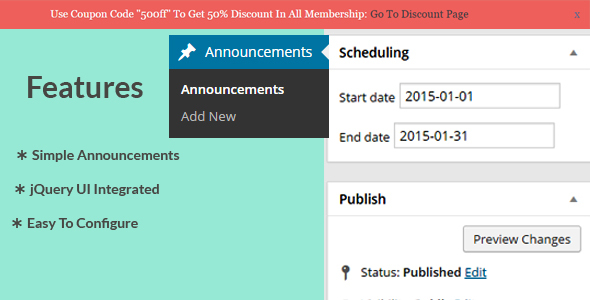 Best WordPress Announcements Plugin integrated with Custom Post Type. WP Awesome Announcements based on latest JQuery UI. No need extra configurations for WP Awesome Announcements. WP Awesome Announcements allows to create unlimited Announcements Items with Title, Description. With the plugin installation’s a Custom Post Type named “Announcements” will be created automatically. WP Awesome Announcements includes- Title, Description.